Guanajuato is one of a group of old silver mining cities, which also includes San Miguel, Zacatecas, Queretaro, San Luis Potosí and Alamos. You can discover all these places with Mexperience. These cities all lie northwest of Mexico City. Each has its own unique character, features, and atmosphere and together they make up some of Mexico’s best inland travel experiences. Mexico’s colonial cities are not overwhelmed with tourists as some of the coastal areas can be. 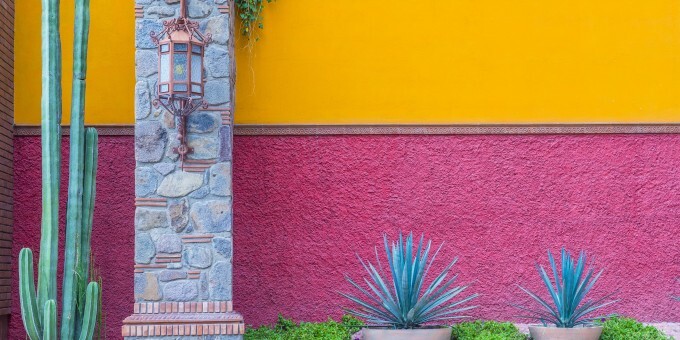 It’s in the colonial cities that the real Mexico begins to emerge: places where you’ll experience magnificent scenery, stay at wonderful colonial hotels that offer terrific value for money, and savor local foods and flavors as colorful and diverse as the cultures that created them. Guanajuato (gwah-nah-HWAH-toh) is a colonial gem sitting in a valley around 220 miles northwest of Mexico City. 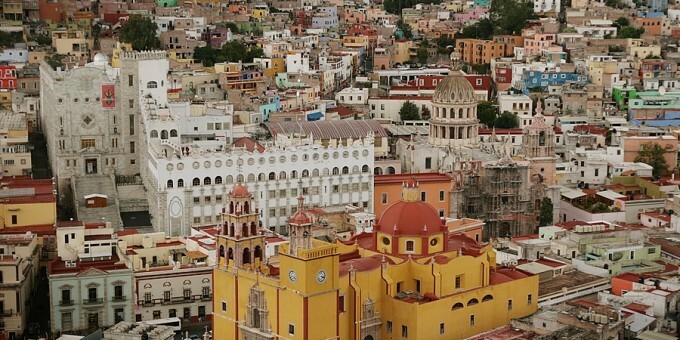 If Mexico’s colonial cities were a crown, Guanajuato would, without doubt, be its prime jewel. The town has been named as a World Heritage Site by UNESCO. The great architecture of this gorgeous city was built using the enormous wealth generated from the silver mines that enjoyed their heyday during the 17th and 18th centuries; during this period, Guanajuato was the source for one-third of the world’s silver. Today, you can see Guanajuato in its unspoiled and beautifully preserved splendor. Coming here is like stepping back in time; the city is remarkable and offers visitors an authentic colonial experience amidst one of the most picturesque colonial backdrops to be found anywhere in Mexico. Guanajuato is clean, tidy, and very safe. Its cobbled streets twist and turn, so just walking around is an adventure. The city’s maze-like layout often creates opportunities for serendipitous encounters, with visitors discovering things they had never planned to see, but are glad they did. This city has a genuine colonial look, style, feel and atmosphere. Cobbled streets, churches, asymmetrical buildings, an amazing tapestry of color, vibrancy and sheer historical splendor await all who visit. You’ll need a good pair of walking shoes and a reasonable level of fitness to enjoy the city on foot, some roads and alleyways feature steep and steady climbs, sometimes along cobbled pavements. Guanajuato remains largely an undiscovered treasure among foreign tourists to Mexico. It’s a very popular weekend getaway for Mexicans and their families living in the region, and if you make the time to come here, you won’t be disappointed. Guanajuato doesn’t have a main square like the other colonial cities; but the Jardín de la Unión (Union Garden), an intimate tree-covered urban green space, is a popular meeting place. However, Guanajuato does have lots of small plazas, each of which is connected by an intricate and complex series of cobbled streets and narrow alleys. Guanajuato winds and bends all over the place—it’s a delight to discover. Get a tourist map at the local tourism office (see below). If you get lost, the locals are very friendly and will point you in the right direction. Some of the more photogenic plazas are Plaza San Roque, which hosts outdoor theater productions during the Festival Cervantino and Plaza de la Paz, adjacent to the Basilica and surrounded by mansions, owned by former silver magnates who lived here during the boom years. Teatro Juarez is a major attraction – the architecture outside and the decor inside are both well worth a look. For great bird’s-eye view photographs of the city get up to El Pipila; the statue at the top of the hill, commemorating Jose de los Reyes Martinez, who is said to have given his life opening the doors of the granary where Guanajuato’s rich and powerful were sheltering, enabling the rag-tag independence army to take control of the town during the struggle for Independence. Templo de Cata is a small miner’s church, which you’ll see up on the mountain to the north of the city. Admission is free and this is another good place from which to take photographs. The Basilica is the main place of worship in Guanajuato; other main churches include Iglesia de San Diego, Templo de la Compañía de Jesus and Templo de San Francisco. Callejon del Beso – alley of the kiss – is famous for its balconies, which are so close to each other they nearly touch. Locals will recite an old tale of forbidden lovers for a small tip. Guanajuato’s Mummy Museum is situated just outside of the town on the northwest side. The local water supply is so packed full of minerals, that people who drink it all of their lives are effectively preserved naturally when they die. Coupled with the ultra-dry climate, their bodies don’t decompose, and those who cannot afford the cemetery’s land rents end up cremated or on display at the mummy museum (only about 1% end up here). Glass cabinets house mummified remains of the dead, and a tour guide will happily tell you stories about the people currently on display. Rather macabre, but also a fascinating tour – certainly different. Those who like art won’t want to miss Diego Rivera’s birthplace. The house has been restored recently and converted into a museum. Some of Rivera’s early works are on display. This festival, held in October each year (exact dates vary) is in celebration of Cervantes (of Don Quixote fame), during which time you can experience exhibitions, arts and performances from artists around the world. This festival is one of the biggest and most important festivals in Mexico, and one of the most repected festivals in the world. To find out dates and events, visit the organizer’s official website. This is an incredibly busy time in Guanajuato and we recommend that you Book your hotel accommodation early. Besides being one of Mexico’s most beautiful colonial cities, it is also a top venue for people who want to attend a residential Spanish School to mix learning and pleasure in the World Heritage city of Guanajuato. There’s no better way to learn Spanish than by becoming immersed in it at a language school in Mexico. Read our guide to Learning Spanish in Mexico for more details and to find a language school in Guanajuato. The climate in this region is ideal for golf and there are several good golf courses in the area to enjoy. By Air – The closest airport is between León and Silao “Bajio International Airport”, and stands about 40km (about 25 miles) from Guanajuato. The closest (main) airport is Leon. The only way to get back and forth to Guanajuato from the airport is to drive you own car or take a private taxi. For detailed information about flights and flying, see the Mexperience guide to Air Travel in Mexico. By Bus – You can travel to Guanajuato on a luxury bus from Mexico City— the trip takes around 4 hours. There are plenty of buses to Guanajuato, all day, every day. For detailed information about bus transportation read the Mexperience guide to Bus Travel in Mexico. By Car – Driving to Guanajuato is very fast and efficient now that many high-speed and safe toll roads connect with the city. It looks longer on the map, but Highway 57, leading to Highway 45D, then Highway 45, and lastly bear east on Highway 110 is the fastest route (tolled, four-lane carriageways all the way). See additional information about Driving in Mexico and Mexico’s Toll Roads on Mexperience. Festival Cervantino Internacional: This festival, held in October each year (exact dates vary) is in celebration of Cervantes (of Don Quixote fame), during which time you can experience exhibitions, arts and performances from artists around the world. This festival is one of the biggest and most important festivals in Mexico, and one of the most repected festivals in the world. To find out dates and events, visit the organizer’s official website. This is an incredibly busy time in Guanajuato and we recommend that you Book your hotel accommodation early. Exchanging Currency: Banks with ATM machines are found throughout the downtown area of Guanajuato. During business hours, they and the local Casas de Cambio will buy traveler’s cheques and cash from you as well. For detailed information about exchanging and managing your money, read the Mexperience guide to Money in Mexico. Cervantino Festival: If you plan to visit and stay in Guanajuato during the Festival Cervantino, book early. Last minute hotel rooms are impossible to find at this time, and most last-minute visitors to the festival end up staying in the nearby towns of Queretaro, Leon or San Miguel and drive in to Guanajuato during the day. Guanajuato has a selection of good night spots to suit those looking for culture and those looking for a party. Night Bars / Restaurants – There’s a good variety of late night entertainment in Guanajuato to keep you entertained into the early hours at nightclubs, restaurants and bars across the city. There are several markets, including the Mercado de Hidalgo which sells fruit, vegetables and fresh meat on the ground floor; upstairs, around the edge of the balcony, you’ll find arts, craft works and Mexican pottery. Guanajuato enjoys year-round, spring-like and very dry weather. The climate is ideal for taking part in a variety of outdoor sports and activities and for taking in the local culture, architecture and scenery. Rain is seldom; the infrequent thunderstorms happen April thru November and tend to be fierce and brief in the late afternoons, leaving the evenings dry and cooled off. Winter nights can get quite cold – down to freezing, so pack some warm clothes during these times.